Quick-change backing pads, QC backing pads, twist on pads, type S backing pads, type R backing pads, disc pads, disc holders, SocAtt pads, Roloc pads, type TR pads, type TS pads, type II pads, type III pads. 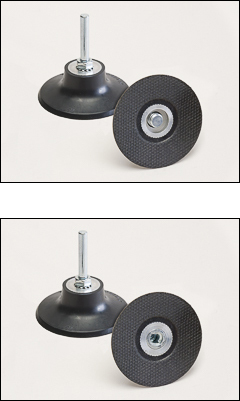 These rubber backing pads can be used with 2" and 3" quick-change discs or Surface conditioning discs . WARNING: Proposition 65 Label for all quick-change pads shown below. Type S rubber disc holders with 1/4" steel shanks. Metal hub on the pad face with metal threads (male) accepts the Type S sanding discs or surface conditioning discs. Compatible with the Standard Abrasives Quick-Change SocAtt® system. with ¼" steel shanks. Metal locking device (female on the pad face accepts the plastic threaded spindle (button) on Type R sanding discs or surface conditioning discs. Compatible with the 3M Roloc attachment system.